One small girl, one (not so small) landship. Written by doef1997 on April 7th, 2019. I imagine trying to survive an apocalypse is tough. I want to believe I’d be the fearless Tallahassee of Zombieland fame, but I’d probably end up like the poor, fat blighter at the beginning of the film — a human happy meal. 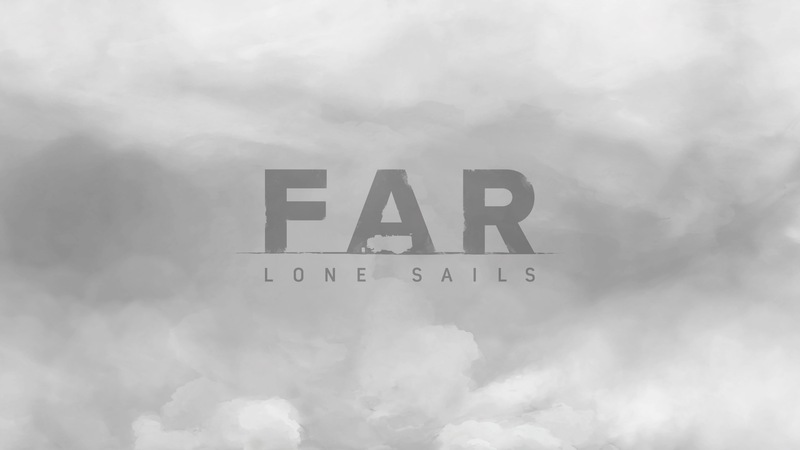 Of course, the apocalypse doesn’t have to feature any sort of zombie or flesh-hungry monster, and this is very much the idea behind FAR: Lone Sails, a side-scrolling adventure/puzzle game that tasks you with simply getting your landship to the ocean in hopes of finding a fresh start somewhere else. The game starts with the protagonist (you, a small girl) suffering from a personal loss in her family. Now alone, she embarks on a quest to reach new lands and put the past behind her. One thing that immediately struck me was the game’s art style; if you’ve played Inside or Limbo then you know what to expect. The post-apocalyptic world is one of ruin, with backgrounds dwarfing the foreground and signifying the sense of just how small you are in the world. Objects and structures are often in a state of disrepair, but nothing feels menacing. It’s almost as if the world has given up and is at peace with itself, radiating a melancholy vibe to the events that transpire. Get used to the inside of your landship, it’s home now. Those events themselves aren’t all terribly interesting on paper. In short, your goal is to spend roughly two hours traversing the landscape (which as a minor negative can be dark at times, so whack the brightness up) in search of the ocean, where you can hopefully find others with whom to start a new life. Along the way, a few puzzles will have you clearing obstacles from your path so you can continue onwards. The game’s charm and the reason it stands out to me is the main standout addition and arguably second character — your landship. This rickety old vehicle is where you’ll spend 90% of the game, with its flaky paintwork and creaky pistons only adding to its charm. 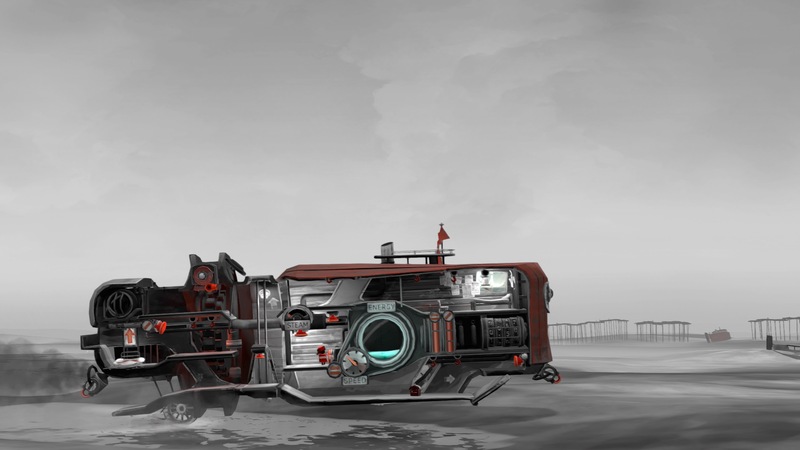 FAR: Lone Sails plays out largely in black, white, grey and brown tones, but both you and the landship are red and distinguishable amongst bleak surroundings, and a reminder of hope in the desolate world. What makes the landship feel more like a character than the actual protagonist is the way in which it must be cared for, acts like a living thing, and can be upgraded. To elaborate, the landship requires fuel to keep its fires stoked and wheels turning when moving through the landscape. Doing so is a simple enough case of topping up the furnace with items found on the floor outside your craft. Initially, this involves having to stop the landship so that you can retrieve items manually, with a later upgrade allowing for instant pickup upon driving over them, which saves a little hassle. The amount of travel you can get before needing to feed the iron beast is somewhat minimal, with items needing to be used at a regular rate. However, I’m not sure if the game adjusts to your progress or not, but never once did I become completely immobile and need to resort to loading an older save. To further aid this problem comes the sails you acquire for the landship early on; these bad boys sprout from your ship like majestic wings and can carry you across the desolate lands if the wind is right. 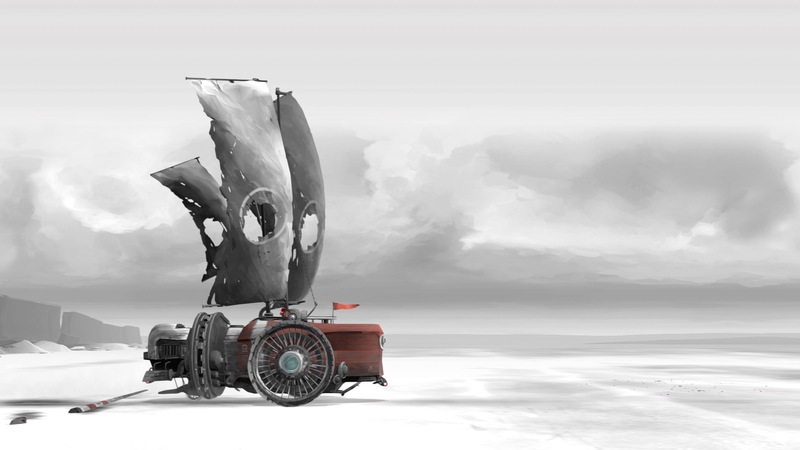 What makes the landship feel alive is how it responds with parts of its mechanical body. For example, if the wind is blowing in the right direction AND you burn fuel, you’ll be cruising along faster than The Flash after 100 coffees, but if the wind is against you or a particularly steep hill requires large amounts of fuel to trudge up, the audible noise inside the landship is almost like an old man (or me) groaning when they have to walk up a flight of stairs. Tension in the game comes from the damage your landship can take, which makes it feel like you’re neglecting a living being if you leave the repairs unfinished. If you don’t vent off the steam created by the vehicle, fire will build up and eventually destroy it. Similarly, your sails can take damage (especially in sections of the game featuring storms, so be wary of that) and neglecting to put out the flames will result in death. A repair module does get installed later in the game, at which point bumps and scrapes (and a devious hail section) become more prevalent, and using it is an easy enough task if you keep on top of things. As for your hose, effective though it is, it’ll only work if you’ve energy in the tank — so bare that in mind! FAR: Lone Sails has genuinely stood out to me for the way in which it seems like it shouldn’t work, but absolutely does. Throughout your runtime there’s also a fantastic score to listen out for. Sound is minimal; all you’ll hear is the hum of the engine and creak of the pistons, the lashing of hail hitting the hull of your ship, or a slow jazz tune to accompany your journey. It’s often subtle but adds further nuance to the game and a genuine sense the landship is as alive as you are. Few games have seemed so minimalist to me, yet had such a great impact. For that reason, I think the game deserves all the praise I’ve seen others giving it, and then some. Sometimes the apocalypse doesn’t need to be filled to the brim with angry mobs or brain-munching baddies. Sometimes it can be quiet and melancholic, with more charm than hundreds of games that have come before. Time to get the fire roaring, because FAR: Lone Sails deserves your attention. Graphics: Visually akin to Inside and Limbo, this game is a joy to behold. Sound: Sometimes subtle, sometimes not so subtle, but always 100% brilliant. Controls: Simple enough to get the hang of, somehow making all the pieces fit together like peanut butter and jam. Progression: As Luke Cage once said, "Always forward, never back." In other words, brilliantly paced and never a drag. Story: Nothing mind-blowing to get your head around, yet subtle and impactful. You'll have to play it to find out why. Final Rating: 9/10. Sometimes the apocalypse doesn’t need to be filled to the brim with angry mobs or brain-munching baddies. Sometimes it can be quiet and melancholic, with more charm than hundreds of games that have come before. Time to get the fire roaring, because FAR: Lone Sails deserves your attention. Few games have seemed so minimalist to me, yet had such a great impact. Part time zombie-slayer, full time ice-cream lover. No horde will keep me from the dairy goodness.